Bourn & Koch provides precision automated machine tool solutions for the global manufacturing community. We specialize in gear manufacturing equipment and precision grinding machines with the ability to specially engineer custom solutions for some of the most challenging manufacturing applications. We support 28 American Machine Tool Companies with repair parts, field service, retrofit & rebuild. Over 2500 years of engineering expertise in our archives allows us to engineer custom solutions for today’s manufacturing market while keeping the machines that built American industry alive. New Bourn & Koch Horizontal Gear Hobbers and new Fellows Gear Shapers. New & remanufactured machines available and in-stock. New Blanchard Vertical Surface Grinders and Springfield Vertical ID/OD Grinders. New & remanufactured machines available and in-stock. American-Made parts for American-Made machine tools. Bourn & Koch offers OEM repair parts, field service, rebuild, and retrofit for nearly 30 legendary machine tool brands. 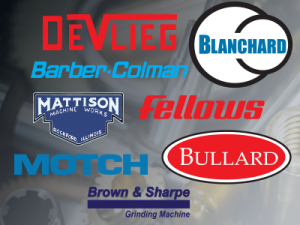 Retrofit & Rebuild services for Bullard, Blanchard, DeVlieg, Fellows, and many more of our legacy machine tool brands. We offer full machine rebuild, CNC retrofit, magnetic chuck rebuild and numerous other services.